In the next 24 hours we have 3 major monetary policy announcements but we’ll talk about the first two today and the third tomorrow after the dust settles. Tonight the Bank of Japan reviews its monetary policy and on Wednesday afternoon the Federal Reserve will decide whether an interest rate hike is necessary. BoJ Preview – The FOMC meeting is the main focus but the bigger surprise could come from the BoJ. The Bank of Japan has a history of unexpected moves and in recent weeks there’s been talk that they may have to drive rates deeper into negative territory. 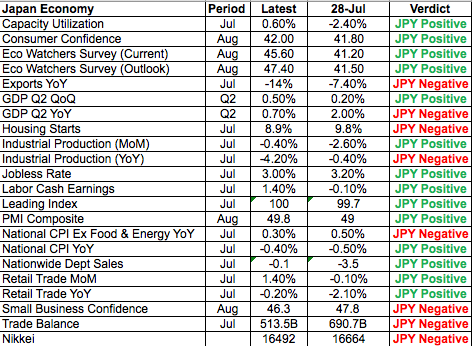 We can’t rule out a surprise move but taking a look at the table below which compares how key economic reports have changed since their last meeting in July, there’s actually been more improvements than deterioration in Japan’s economy. Consumers are more optimistic, they are spending and economic activity is crawling back towards expansionary territory. However exports remain weak and inflation low – two big problems for Japan. The recent strength of the Yen exacerbates the pressure on exports and manufacturing activity, making it necessary for the BoJ to consider easing policy. There’s a few changes the central bank could make including buying fewer long term bonds and more short term bonds which is mildly Yen negative. They could also remove their timeline for reaching their 2% inflation target. Either one of these changes would take the yen slightly lower before investors start buying it again. Bolder more aggressive action is needed to put a top in the yen and a bottom in USD/JPY but the chance of that happening is slim and we believe that at the end of the BoJ meeting, investors will be disappointed. FOMC Preview – There’s also been as much improvement as deterioration in the U.S. economy but there’s more softness where it counts. Retail sales for example contracted in August as job growth and wage growth slowed. Service sector activity grew at a slower pace while manufacturing activity accelerated. Yet low interest rates is keeping the housing market afloat and inflation is on the rise. There’s not enough here to justify a rate hike in September but the Fed could argue that rates may need to rise in September. Given the unlikely chance of a rate hike this week what’s important is guidance. There is no question that the central bank will recognize the improvements in the economy and the easing of global risks but if the Fed stands down in September, the dot plot forecast will have to change to reflect only one rate hike this year. This along with a decision to hold rates steady should be initially negative for the dollar but if more than 1 member of the FOMC dissents from steady rates and Janet Yellen repeats what she said at Jackson Hole – which is that the case for a rate hike has strengthened, the dollar will soar. Barring a major surprise, by end of day Wednesday we expect USD/JPY to be trading higher than where it was pre-FOMC and EUR/USD to be trading lower. Meanwhile sterling extended its losses taking GBP/USD below 1.30. After the U.K. voted to leave the European Union in June we had a few weeks of calm as Prime Minister May pledged to take her time to invoke Article 50. This led some investors to hope that the terms of exit would be anemic or better yet, not occur at all. However in the past week, all of the fears related to Brexit have returned. It now seems that Article 50 will be invoked in the early part of next year and the government will stay true to voters’ calls for restrictions on immigration. At the same time the EU hasn’t shown any signs of leniency and now investors are worried. 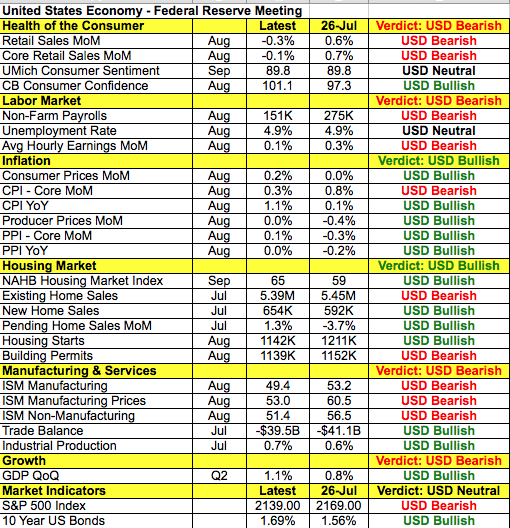 While the August low of 1.2865 appears to be the next stop for GBP/USD, the near term outlook for the currency pair hinges entirely on the market’s reaction to FOMC. The EUR/USD is also trading heavy ahead of the FOMC announcement but the currency pair remains confined between the 100 and 200-day SMA. Commodity currencies were mixed today with CAD giving up early gains to end the day unchanged and AUD and NZD trading higher. The Australian Dollar was boosted by the slightly upbeat minutes released by the RBA last night. The RBA revealed that the main driver for leaving interest rates on hold in September was because it sees that current monetary policy as being accommodative to its inflation goals. The minutes also repeated that it see the rising AUD as a threat to the country’s plan of economic rebalancing but traders shrugged that along with lower house prices off quickly. The New Zealand dollar traded lower after the Global Dairy Trade auction results. We were surprised by the reaction but the increase marked the fifth consecutive rise in GDT prices today. Admittedly the 1.7% increase was a stark drop when compared to last month’s 7.7% rise but the fact that GDT prices have been continually increasing is a good sign for the RBNZ.